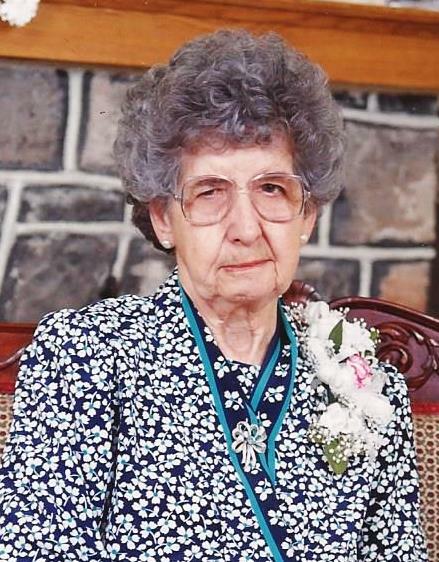 Obituary for Ellen Jane Carty | Harold M. Zimmerman And Son Funeral Home Inc.
Ellen Jane Carty, age 100, of Greencastle, PA, passed away at her daughter’s home on Saturday, February 9, 2019. Born November 6, 1918, in Warren Township, Franklin County , PA she was the daughter of the late Benjamin and Effie Rager Shives. A seamstress most of her adult life, Mrs. Carty worked at the former Stanley Company in Chambersburg, where she retired in 1984. She enjoyed reading, baking, and especially crocheting. She earned numerous awards at the PA farm show for some of her crocheted pieces. Surviving are seven children, Donald R. Carty (wife Joan) of Greencastle, PA, Edith J. Kanner of Chambersburg, PA, Myrna Yaukey (husband Ronald) of Fayetteville, PA, Carl Dean Carty (wife Cinda) of Greencastle, PA, Betty Rowe (husband Glenn) of Fayetteville, PA, Susan Martin (husband Dale) of Greencastle, PA, and Samuel Carty of Greencastle, PA; 20 grandchildren, 39 great grandchildren, numerous great-great grandchildren, and three siblings, Robert Shives, Rachel Gray, and Betty Earnest. In addition to her parents, she was preceded in death by her husband, George L. Carty in 1973 and two children, Daniel Carty and Judith Sanders.